Performed for the first time in its original uncut version, this production of Guillaume Tell was the jewel in the crown of the 25-year history of the �Rossini in Wildbad� opera festival. Rossini�s final, great, operatic masterpiece is a story of liberation, the oppressed Swiss attaining their ideal of emancipation by hounding the tyrannical Habsburgs out of their country. Although it was composed for the complex demands of the Paris Op�ra, numerous dances, choruses and arias were dropped for reasons of practicality. These are restored in the present recording which also includes the stunning finale of the shorter 1831 version of the opera. 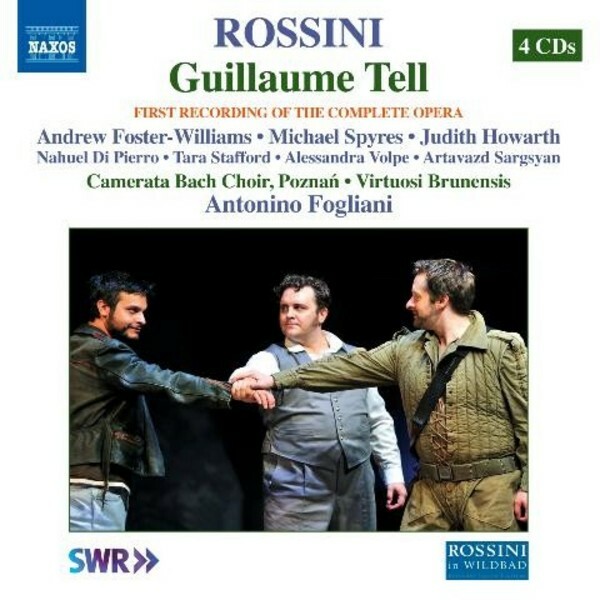 Antonino Fogliani made his celebrated d�but at the Pesaro Rossini Opera Festival in 2001 with Rossini�s Il viaggio a Reims, followed by various engagements in Pesaro and in leading opera houses, including La Fenice in Venice, the Teatro dell�Opera, Rome, the San Carlo in Naples and the Op�ra Comique in Paris, as well as the Bergamo Donizetti Festival. He made his d�but at 'Rossini in Wildbad' in 2004, leading to a series of further performances and recordings. He was appointed musical director of 'Rossini in Wildbad' in 2011.